Perhaps it is the long-form nature of television that has this viewer interested in digging in deeper. These days, it feels as though every plot could get expanded upon further. In the case of “Mirage,” this is especially true of its ending. If there is one thing that the thriller on Netflix could have spent just a little more time on, it is that. Here’s why. Caution: Spoilers for the ending of the movie “Mirage” (“Durante la tormenta”) are below. “Mirage” ends with a startling revelation, even if it is one that seems self-evident. It turns out that Nico Lasarte has been with Vera the entire time. He is the detective that has been helping her. Courtesy of a name change, Nico keeps the truth a secret from Vera. It turns out that he has known Vera from the minute she arrived at the police station for help, and not entirely for the reason viewers may have initially thought. He does not just recognize her from seeing her on the television, all those years ago. After everyone came to believe he was mentally ill, the movie explains that Nico grew up searching for the woman he saw on the TV. This is when Nico's connection to Vera goes from expected to entirely unexpected. That is because there is more to it than what happened with Vera's warning. Nico and Vera met as adults, fell in love and got married. That's right. In the new timeline, Vera is married to Nico. Hence, when she shows up, she does so as his wife. Nico explains that he knew the day of the storm would arrive. However, he never expected her to forget their entire life together. Why she does not remember it is something that never gets explained. For most of the movie, Vera only remembers the life in which she is married to a philandering husband with whom she shares their beloved daughter, Gloria. She does not recall her life with Nico until the very end of the movie. Wanting to reunite with her daughter, Vera urges Nico to correct the timeline. She then ends her life in the second timeline by jumping off the roof of the apartment building, she and Nico are standing on together. When she wakes up, Vera’s previous life has gotten restored, and an adult Nico is still alive. She soon realizes that her husband is a cheater in both timelines. As she did in the second timeline, she also exposes the truth about the neighbor’s death. Vera also seeks out Nico, and the two meet as a vague sense of their future hangs in the balance. The ending of “Mirage” leaves the impression that they may end up together, after all. There are a few lingering questions that remain. Why does Vera only have a child in one timeline and not both? “Mirage” could have complicated matters further by having Vera be a mother in both universes. Instead, she is only one in the firstly revealed life. The potential explanation for this lies in Vera’s pursuit of and realization of her medical dreams. She was also on that track in the original timeline before she chose motherhood. Why would the same opportunity not have arisen in her other life with Nico? Is “Mirage” hinting that Vera’s "first" husband did something to change her course? It is just a theory. Had Vera been a mother in her second life, “Mirage” would have dealt with a complicated scenario. In truth, I almost thought the movie was going to go there at the last minute with another big twist. That curveball being that Vera also had a child with Nico. It did not happen though. In many ways her not being a mom in the second timeline sort of feels like a plot-driven choice to have her old life restored. At the core, “Mirage” is not about Vera choosing one partner over another. It is about her putting her daughter ahead of everything in her life. All of which makes sense. If she had a child in both timelines that would not have been as easy a choice. Had she been faced with being a mother to a slightly altered version of Gloria, would she have made the same decision to end her life? It is a thought-provoking question. Why could Vera not remember both of her lives for so long? Nico himself asks this without being able to answer it. Either it was a fluke or the story’s way of telling the audience that Vera’s first life was the “real” one. “Mirage” spends a lot of time setting up Vera’s timeline with her family in the first part of the movie. It is time well spent as it makes the audience invest in it too. What “Mirage” does not spend a lot of time on is Nico’s devastation and Vera sifting through her feelings upon recalling their life together. The thing is, for whatever reason, they do not have a child. Hence, Vera’s choice to end her life in the second timeline to reunite with Gloria. Nico does not appear to struggle with what to do next. He understands Vera's maternal devotion and does the right thing by sacrificing the life he loves with her so that she can have her daughter back. Before the movie ends, Vera meets back up with him in the third version of her life. She seems interested in pursuing a relationship. "Mirage" leaves viewers without knowing what comes next. Does she tell Nico everything? Will he believe her? Could there be a sequel? This is one of those rare times a movie has genuinely earned one. What did Nico say to younger Nico? We never learn precisely what Nico told his younger self on the television. Apparently, he never told him about their neighbor’s death. Was that so Vera would find him in the next timeline? It is also unclear if young Nico ever told anyone about seeing his older self on television. That would have led to him facing a similar fate to the one he had in the second timeline. Hence, adult Nico probably told his kid self to keep that info to himself. Are you still with me? Okay. Next item. Following a lot of out of context scenes, the ending revealed the exact circumstances of the neighbor’s demise. She did not get murdered as "Mirage" initially indicated. Distraught over her husband’s affair, the wife reacted violently, ultimately leading to her accidental death. That it was not a murder never gets officially addressed. The explanation does help clarify the opening of “Mirage” wherein it was clear the neighbor was distraught over Nico’s also-accidental death. If the neighbor was a cold-hearted killer, why express such despair? “Mirage” indicated there was more to the story and it delivered on it. “Mirage” is a terrific thriller with tremendously thought-provoking sci-fi thrown in as well. There are a lot of unanswered questions about Vera’s future at the end of “Mirage.” The only thing that matters is evident. By the time the movie ends, she has her daughter back. Everything else will have to fall into place...or not. 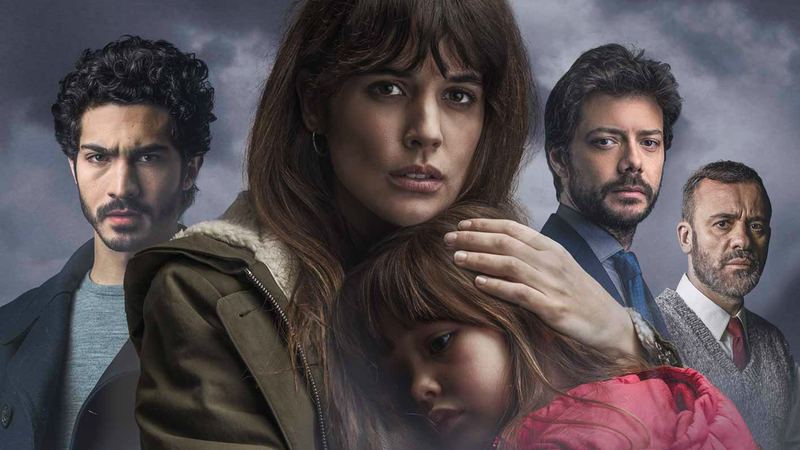 "Mirage" (originally titled "Durante la tormenta") is currently available to stream on Netflix.